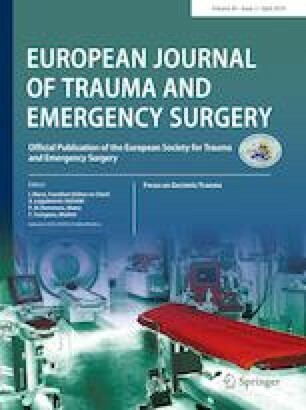 Hemodynamically unstable pelvic trauma has been a significant challenge even in most experienced Trauma Centres. In 2011 preperitoneal pelvic packing (PPP) was introduced in our Hospital as the first manoeuvre. This study aims to review overall mortality at 24 h from arrival in the emergency department. A retrospective review of our prospective database was performed considering patients with systolic blood pressure (SBP) < 90 mmHg or with the need for more than 2 Units of packed red blood cells (PRBC) on admission in the emergency department, (ED) and a pelvic fracture. Values were expressed as a median and interquartile range. Continuous variables were compared with the Mann–Whitney test. Between September 2011 and December 2016, we treated 30 patients. Median age was 51 years (40–65) and Injury Severity Score 36 (34–42). SBP in the ED was 90 (67–99), heart rate was 115 (90–130), Base Excess − 8 (− 11.5/− 4.8), pH 7.23 (7.20–7.28). Median PRBC requirements during the first 24 h (from admission) were 13 Units (8–18.8). Time to emergency treatment was 63 min (51–113). 17 patients (56.6%) underwent angiography after PPP. Overall 24 h mortality was 30%. A comparison between survivors and non-survivors showed no statistically significant differences between groups. In our experience, PPP resulted to be quick to perform and effective. No death occurred from direct pelvic bleeding. We are indebted with Carlotta Galeno for her help in retrieving data. Study conception and design: SM. Acquisition of data: SM, MC, NA. Analysis and interpretation of data: SM. Drafting of the manuscript: SM. Critical Revision and consent for publication: all authors. No financial support was given for this study.